The Calendar Invite enhancement makes it simple to invite people to an event. And, with the click of a button, they can RSVP and add the event to their own calendar. To instantly create a calendar invite, click the calendar icon in the top bar of the compose window. You can also use the slash command: type /invite to launch the calendar invite enhancement. Next, fill out the event details (title, location, description, and time zone). Mixmax remembers event titles, locations, and descriptions you've used before: just start typing and the information will autocomplete. You can also select prior titles, locations, and descriptions by clicking the arrow. For time zone, select the time zone of your recipients. 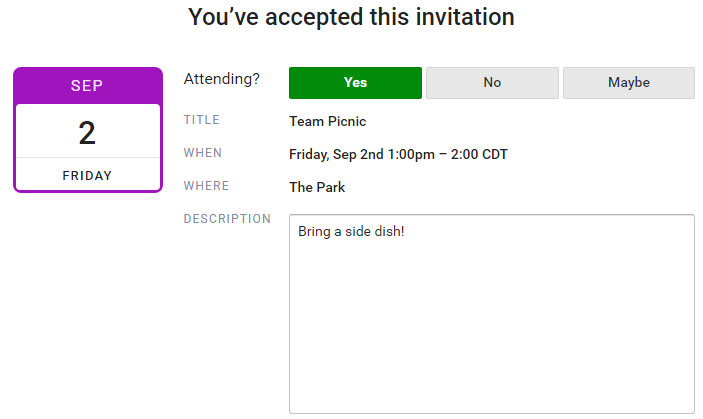 You can add additional guests who will automatically be added to the event as soon as your recipient replies. You can schedule on your own calendar, or schedule on someone else's calendar. 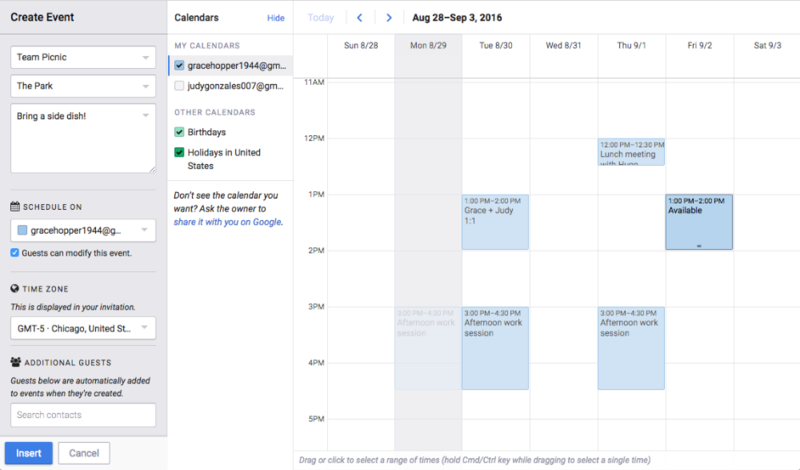 Here's how to schedule on shared calendars. Next, select the date and time for the event. Click and drag to extend the duration of the event. You can also drag the bottom of the event up and down to change the duration. The times on the calendar appear in your time zone, and will automatically convert to your recipient's time zone when you insert the invitation in your email. Once you are done, click Insert at the bottom left. This is how the invitation will look in the email. What you see in the compose window is exactly what your recipients will see. Once you send the email with the calendar invite, the event is automatically added to your recipients' calendars. Your recipients simply RSVP by clicking a button in the email. After they click, they'll be directed to a confirmation page — you can customize this page with your logo and colors with custom branding. As soon as they respond, you'll receive a confirmation email. If plans change, your recipient can change their answer either in Google Calendar or by clicking a different button in the email they received. You can also update the event in Google Calendar.